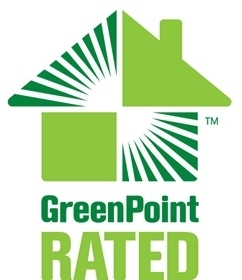 GreenPoint Rated is a program of Build It Green, a professional non-profit membership organization whose mission is to promote healthy, energy and resource efficient buildings in California. GreenPoint Rated´s recommended measures and performance benchmarks specifically address climate and market conditions in California. They are recognized by third party sources, including the California Air Resources Board, the California Energy Commission and the Association of Bay Area Governments. Ratings are performed by certified GreenPoint Raters, independent professionals who are trained and certified by Build It Green. The rating process is a non-invasive physical examination of building systems, structures, materials and components to assess energy and water efficiency, indoor air quality, resource efficiency of materials and construction methods, and construction quality. Partner Energy has extensive experience with the GreenPoint Rated system and requirements, and our team includes Certified Green Point Raters (CGPR). For more information please call 888.826.1216 or email: sales@ptrenergy.com.